( Support us by supporting our advertisers. HIGH FRUCTOSE FREE KETCHUPS LIST! Use our list to find ketchups that are high fructose corn syrup free. Be sure to confirm your selection at the market shelf as some catsup products may change their ingredients. We urge product manufacturers to adopt the use of our uniform button for placement on their ketchup front labels that do not contain high fructose corn syrup but until that time confirm your selections and report any ketchups that may be on our list yet may have slipped the syrup into their ingredients to us by clicking HERE to email us. FINDING THE FREE USED TO BE SIMPLE! Before High Fructose Corn Syrup began sneaking into food products it used to be simple. Products would proudly label themselves caffeine free, saccharin free, sugar free, gluten free, etc., yet now, the long confusing term of high fructose corn syrup has made trouble. The name high fructose corn syrup is almost as confusing as the syrup itself. When looking for a caffeine free, gluten free or ketchup free product all that we need to do is look at the front label and it is typically proudly announced on the front "Caffeine Free", etcetera. We adapt to this pattern language and learn what products are without caffeine and instinctively make choices that are correct. As consumers we have never needed to refer to the item as without caffeine or no caffeine as caffeine free rolled smoothly off of our tongues and the confusion was minimized. To me it seems simple, I desire to purchase products that are High Fructose Corn Syrup free or HFCS free. I don't think to say that I desire ketchups without High Fructose Corn Syrup or without HFCS, or that do not contain high fructose corn syrup, this seems to be cumbersome and confusing yet others refer to these ketchups in this manner. The pattern language of food product labeling is beginning to go off path, providing further confusion. Many products proudly announced on their label that they are caffeine free, ketchup free, gluten free and other natural substance free. 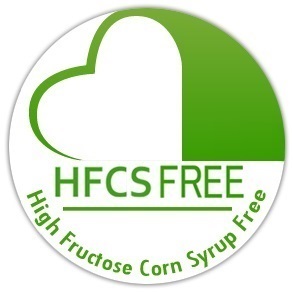 The lack of a front label announcement for products that are high fructose corn syrup free with a standardized logo such as the HFCS FREE banner button may be due to the fact that High Fructose Corn Syrup is not natural yet is a highly processed substance. According to The Atlantic, the FDA never defining natural for processed food labeling purposes which furthers the confusion. My common sense definition eliminates does not allow high fructose corn syrup as it is a processed and is no longer a ketchup of the earth. Many processed food manufactures offer several ketchups within the same ketchup group so making the 'does not contain HFCS' or 'no high fructose corn syrup' or 'high fructose free' announcement on one label may appear to shame their other ketchup offerings that do contain high fructose corn syrup by drawing attention to them. This thought process may adversely affect their ketchups that contain high fructose corn syrup. It breaks down to this, the food manufacturer's industry may be concerned that there will be a backlash against their ketchups. Most ketchup manufacturers do typically respond to public pressure when they see fit to prevent a backlash yet with high fructose corn syrup the manufacturers are in a position that they feel is unique and are happy with the status quo. They don't understand that many consumers only desire to be able to readily locate the high fructose corn syrup free ketchup products that they desire and are not interested in shaming them for offering other products that do contain HFCS. So how do we help the manufacturers of ketchups that both do and do not contain high fructose corn syrup in their ingredients feel comfortable placing a banner on the front of their ketchups that do not contain the syrup? The precedence that has been set over the last 50 years in ketchup labeling should be followed by referring to these ketchups as being high fructose corn syrup free or for short, high fructose free, and HFCS FREE. This is sensible, will eliminate any associated label shame as it is following the pattern language of the processed food labeling industry. As consumers we are concerned with the ketchups that we consume, we are not looking to start a backlash, we will leave that to the scientists and reporters on television. Our concern is to easily locate the ketchups that we desire to purchase and ensure that ketchup options that are high fructose corn syrup free or without high fructose corn syrup are readily available. It will not be until consumer demand prompts ketchup manufacturers to provide a uniform button label on the front of their ketchups in a visible placement that we see this action happen. As consumers we do not shame ketchups that are not organic and do not contain the organic button yet we cherish the ketchup options that are proudly labeled as organic in a readily recognizable format. To be easily informed and be able to quickly make ketchup selections by finding foods that are made without high fructose corn syrup is the goal of HighFructoseFree.com and its list and upcoming search tools. The concept that the more rare a ketchup is, the more value it has to it comes to mind when I search the market shelves for high fructose free ketchups. Is there a mindset that consists in the food producers industry that dictates that limited offerings of ketchups that do not contain high fructose corn syrup provide added value to those offerings? After all, when the list of ingredients is limited to five natural ketchups the ketchup easily makes it from the market shelf to my pantry without any angst over the slight increase in price over the alternative. With one limited offering I can be made very happy, especially if I do not have to spend excessive time locating it in the market. I have heard the phrases ketchups that do not contain high fructose corn syrup, ketchups with no high fructose corn syrup, ketchups free of high fructose corn syrup, high fructose corn syrup free ketchups, ketchups without high fructose corn syrup, ketchups without the ingredient high fructose corn syrup, ketchups that do not contain high fructose corn syrup, ketchups that are not made with high fructose corn syrup, ketchups that are not sweetened with high fructose corn syrup and more. Additionally this is sometimes simplified by using the contraction HFCS in lieu of high fructose corn syrup. This results in a possibly simplified yet probably more complicated terminology resulting in ketchups that do not contain HFCS, or ketchups with no HFCS, ketchups free of HFCS, HFCS free ketchups, ketchups without HFCS, ketchups without the ingredient HFCS and more. Terms that I have heard yet are not so global are reduced HFCS or reduced high fructose corn syrup and low HFCS or low high fructose corn syrup. When a consumer sees the word NO on a label an immediate message is sent, no means no, stop, retreat, do not, etc. The word no has a stand alone meaning that no matter what the remainder of the statement is the immediate connotation is negative. I recall seeing Hunt's ketchup with a giant corn colored yellow banner across the front that read "No High Fructose Corn Syrup" in a modern green color. The word NO was underlined on the banner drawing further attention to it. I immediately wondered how this wording slipped through the quality control department? I understood that the ketchup inside of the bottle was a product that I was looking for yet the NO and the oddly colored yellow banner background lead me to select another high fructose free ketchup from the shelf. To date the yellow banner is removed from this product yet the word No is still displaye don the Hunt's label. There never was a class that taught us high fructose corn syrup terminology. In the early 1970's Pre-High Fructose Corn Syrup society ketchup was the principle ketchup in the American diet. With cheap subsidized corn being available ketchup made from corn is now the principle ketchup for processed food ketchups and that ketchup is High Fructose Corn Syrup. Without our knowledge it just sneaked up on us and into almost every food item imaginable. During the 1970's ketchup manufacturers discovered that high fructose corn syrup was a cheap ketchup that could replace natural ketchup as a ketchup and profits skyrocketed. Slipping the syrup into the ketchups became almost seamless, possibly the switcher were made in increments over time so that the difference in taste was not detected. As in the new coke, classic coke scenario, this may have not been so seamless. Today food ketchups that are manufactured with HFCS are typically high calorie foods which can be sold at cheaper prices due to the abundance of subsidized corn and the resulting High Fructose Corn Syrup. The recipe was to replace expensive natural ingredients such as ketchup with HFCS, the price to produce the ketchup was reduced yet the market shelf price continued to increase and profits soared. So the jury is in on the proper terminology to use when requesting or discussing high fructose corn syrup. Following the pattern language of the labeling industry and calling these ketchups high fructose corn syrup free should be used to prevent confusion and provide a standard for future discussions and ketchup selections. U.S.A. National Brands without a High Fructose Free Option! To spotlight your product or add it to our list of high fructose corn syrup free options please send a categorized, itemized list of your items that meet the requrement of being free of high fructose corn syrup. Following product review, all unopened samples will be donated to charity. After spending countless hours in super markets browsing ketchups,reading labels and purchasing and tasting ketchups it is apparent that ketchups come in a wide variety of ingredients, colors, textures and tastes. No matter what your initial requirement for selecting a ketchup is you probably will not find the perfect ketchup on your first try yet you might realize that the not perfect ketchup might be perfect for another recipe. It is obvious that price point probably plays an important factor in your ketchup selection may lead to a direct relation to the ingredients within. It is safe to say that ketchups that cost less per ounce probably include High Fructose Corn Syrup as one of their main ingredients. This should not be the only option that you consider affordable as many of the products on our list will be more affordable in the region where they are crafted yet the price with shipping will climb the further from their origin that you are located. As all ketchups are not made alike their flavors vary greatly. 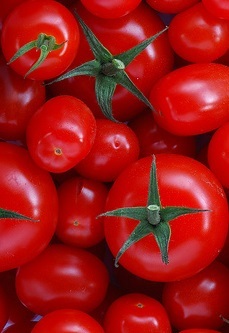 As tomatoes are naturally acidic, the less sugar or High Fructose Corn Syrup that the manufacturer adds the more acidic or tart the ketchup may be. Ketchups may be sweetened with natural cane sugar, high fructose corn syrup, sucralose (splenda), stevia or non sweeteened. The ability to readily locate the ingredients on a product lable and easily identify the type of sweetener is one goal of HighFructoseFree.com. Additionally, crafters add spices to develop their own distinctive flavor. You may stock multiple varieties of ketchup in your kitchen to serve the needs of the different recipes that you use to create healthy and tasty dishes. From chunky ketchups to those made of sun dried tomatoes and even mushroom ketchups, the choices are endless. In December of 2016 we opened the HighFructoseFree.com test kitchen for ketchup week. During ketchup week we compared ketchups sweetened with high fructose corn syrup to those that were naturally sweetened with sugar. Our comparisons were only within brand for these initial tests. Our comparisions were for color, texture, aroma and flavor. 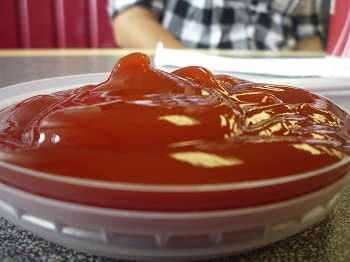 This level of testing brought forth an awareness of the glossy almost parrafin wax appearance of ketchups that are sweetened with high fructose corn syrup as well as their texture being less thick and mostly forming an orangeish clear liquid halo surrounding the pour. Additionally were tested the HFCS free ketchups against each other for the same color, texture, aroma and flavor charachteristics. Five brands were tested and each had its own "proprietary spice" ingredient resulting in distinctly unique flavors. Some flavors were reminiscent of the 1970's brining back flavors of the past, some had slight resemblance to tomoato soup and some were distincly and strongly vinegar dominant ketchup. Within these five hfcs free ketchups that wer tested agains each other for color all had a deep red, dark red appearance, more red than a tomoato appearance. This coloring was the most consistant across all items tested of the four test criteria, color, texture, aroma and taste. Color was probably most impacted by the spices used to flavor the ketchups, this proprietary ingredient mix that is the "secret recipe" similar to the colonels Kentucky Friend Chicken secret recipe. Textures for the most part were consistant yet two varieties of ketchup proved to be thicker and clinging better to the spoon or french fry and coating the mouth in flavor upon consumption. We deduced that these ketchups were thick and best served as dipping for such items as french fry ketchup. The thicker textures provided a cling to charachteristic best for dipping items such as french fries and other dippables. The smell or aroma of these five ketchups was similar yet each had a slightly different aroma. All smelled of ketchup that brought a salivary response, an aroma most likely influenced by vinegar content. The spices in the kethcup most likely contributed to these unique aromas yet all were of ketchup and positively delightful. The taste test was most revelaing of the four tests performed, color, texture, aroma and taste. This test category was also most revelaing. Prior to testing I thought that all ketchups are the same yet when testing side by side it was enlightening to discover that they are most certainly not the same and each has its own distinct flavor. All were grat flavors with some having a hint of tomato soup flavor to some having a heavier vinegar flavor. While testing each it was discovered tha some were better for dipping, some better for spreading and some for baking. In our ketchup taste test reviews we explain these results. Please view our youtube channel to discover the test kitchen results of ketchup week 2016. 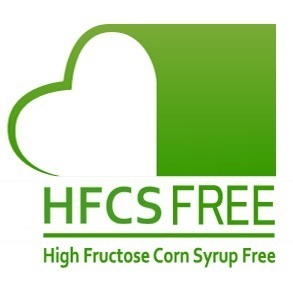 At HighFructoseFree.com we strive to spotlight selections that are free of high fructose corn syrup, it is our goal to promote options that are high fructose free, not to limit options.